I received some feedback from kids, staff, and parents. They all really enjoyed your presentation and felt that it was powerful. The students are already practicing what you taught them! I look forward to working with you more in the future. So many of our students (and staff) enjoyed your assembly. I am so thankful for the impact you made on our school. Thank you very much for your presentation today. It was brilliant and we learned a lot. I will definitely be passing on your information to different people for future presentations. Again thank you and keep in touch. We truly enjoyed your performance and your “HA HA Halloween Show” on October 25th. The children roared with laughter at Wanda and Headlee. Everyone walked away with smiles. Your afternoon presentation to our Primary School students about bullying not only provided great entertainment, but also a powerful message. I hope many other communities can enjoy your talents and messages foryoung people. Thanks for a terrific show. Your message was clearly delivered and something that could be easily reinforced with our students throughout the year. We'll certainly be using the "Stop it! Stop it now! Or I'll tell someone! message with our Gearing Gators. WOW! the best No Bully Assembly I have seen. Hundreds of Westland families turned off violent television programs and video games last Thursday enjoying a night out together. In all 1700 people attended the city's 11th annual Turn Off The Violence program at the Baily Recreation Center. 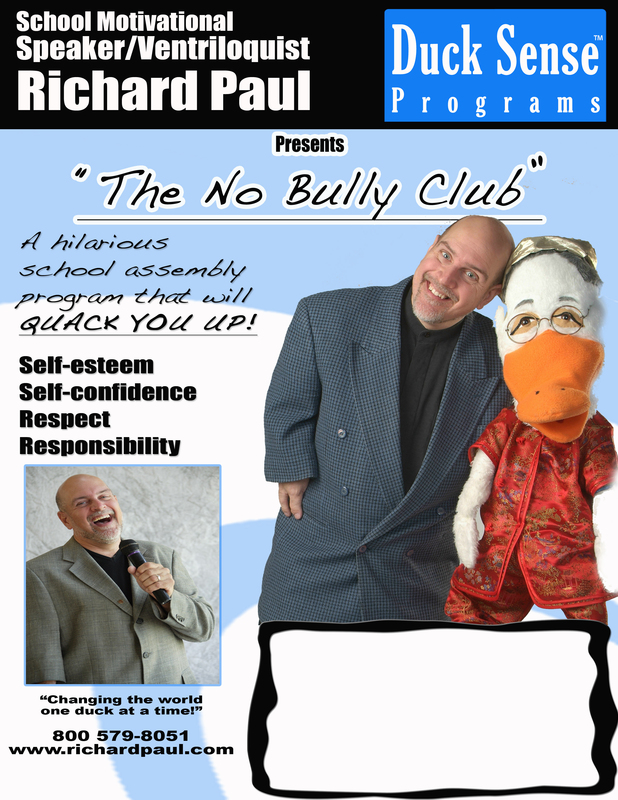 Ventriloquist Richard Paul also drew crowds for his two presentations "Duck Sense for Kids- "No Bully Club" offering helpful tips and suggestions on how to stop teasing and put an end to the violence. "He was wonderful," said recreation program Supervisor Margaret Martin. "His programs were very interactive, so he had a lot of people coming out of the audience." On behalf of Mayor Sandra Cicirelli's Task Force, the Westland Department of Parks and Recreation and all the people who attended the 11th Annual Turn Off the Violence Night, we would like to thank you for your performance. It was a pleasure to work with you and we all enjoyed your presentations. Your effort, combined with the other groups who participated provided a truly unique experience for all the participants and volunteers. For one evening almost 1700 people chose to turn off their televisions, and made a commitment to their families and their community. This event is a success due to the commitment by you. We couldn't have done it without you! Thank you again for being part of this extraordinary event. Thank you for coming to our school and teaching us a little more about bullying. We especially liked Master Peking Duck and Professor Oly Owl! From the students themselves . . . Check out these photos from our shows!